We got our hands on the Fame: Robert Pattinson comic from Bluewater Productions, which is not a fun, fan-fic-ish romp with the SparkleVamp, but a dark, dreary telling of his life story. Also? He looks terrible! Here's how the story begins: "In November 2007, a fledgling, relatively unknown British actor named Robert Pattinson stepped into Powell's bookstore in Portland, Oregon to prepare for a role an an indie film with a near non-existent budget. Alone." Dramatic! But why does Rob look so… Derelicte? It's weird that they stuck this image of Tom Waits in there. But it's kind of awesome that the creators chose to illustrate Pattinson's infamous anecdote about how his sisters used to dress him up as a girl. Notice how the dog's expression is all, "Huh. You don't look like you're gonna grow up and be the dude in Twilight." The text, in addition to telling the story of Pattinson's rise to fame, is peppered with quotes the actor has given to various media outlets. But a true fan won't really learn anything new. 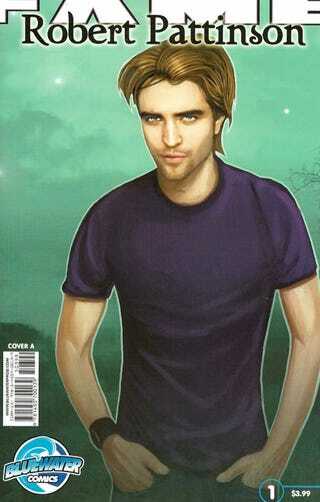 And if you're buying the comic because you think RPatz is dreamy, these nightmarish illustrations might change your mind. Even if you're Team Jacob, you've got to admit: Poor Edward Cullen deserves better!